All of our travels have come to a halt (at least until Labor Day) and it’s time to get back into the swing of cooking. I was craving something fresh and with lemon flavors and came across this recipe in my Martha Stewart magazine and boy did this fit the bill. I used Rotini pasta, as that was what I had, and it was a fabulous combination. The lemon, dill and feta was so fresh and vibrant together. The best part about this was it was a one pot meal in a large sided skillet! 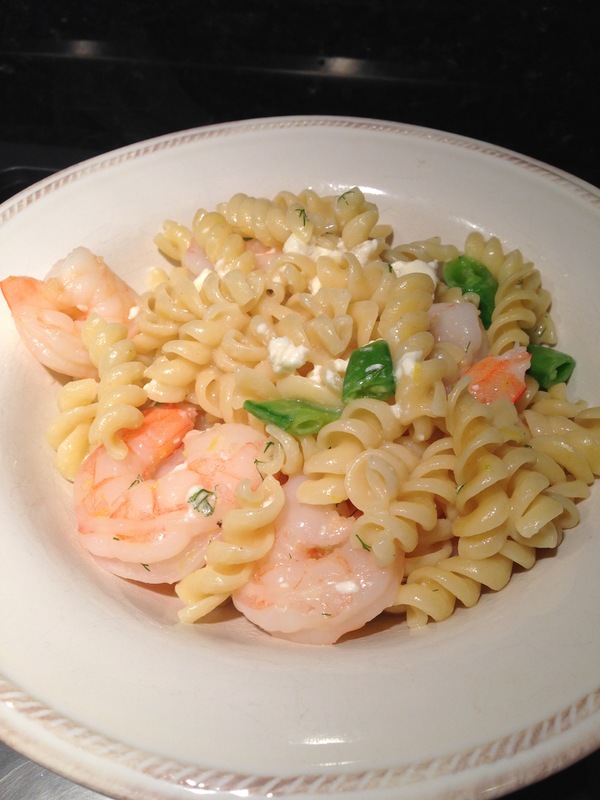 Find the recipe here for Gemelli with Shrimp and Sugar Snap Peas. With school approaching for most of us (although some have started already!) I found a few links some of you may want to use use. 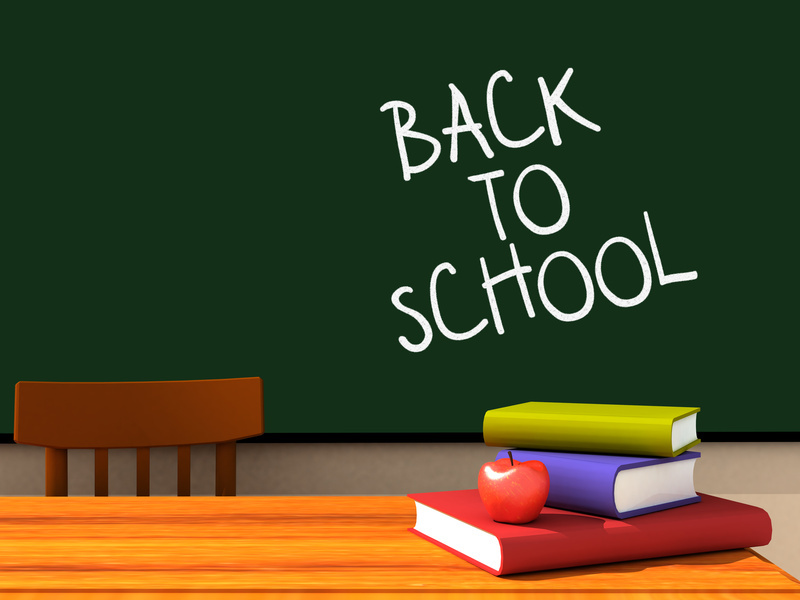 Here are some back to school questions to keep or save in a memory book. Here is a customizable chore chart to get those kids back in the saddle. Also here are some cute notes to put in your kids lunches if you are into that as well. 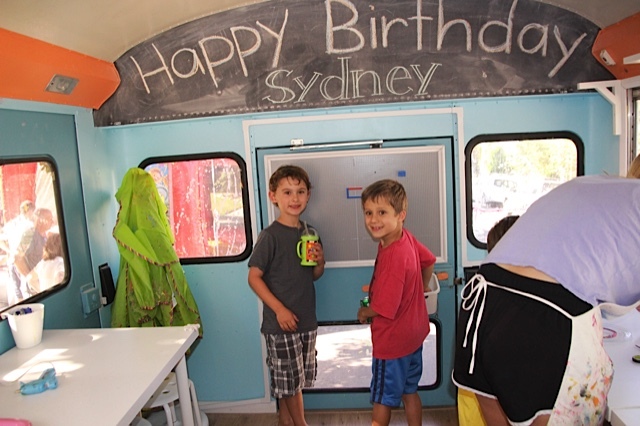 We had an amazing party last night for Sydney’s 4th Birthday, and if I do say so myself, it was one of my best! 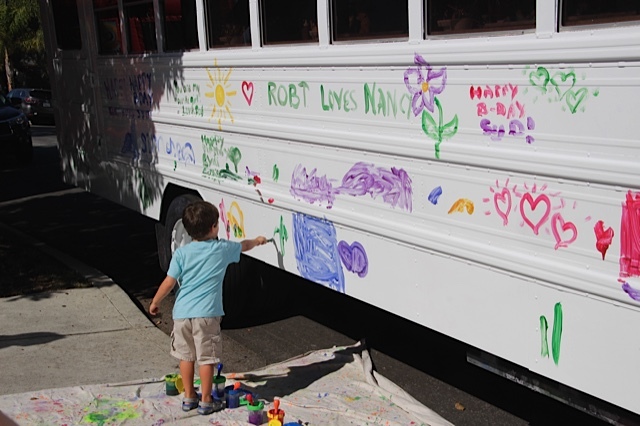 I had read about the Art Bus on Stroller Traffic a while back and booked them before I even finished reading the article. It’s an incredible repurposed school bus (with AC!) 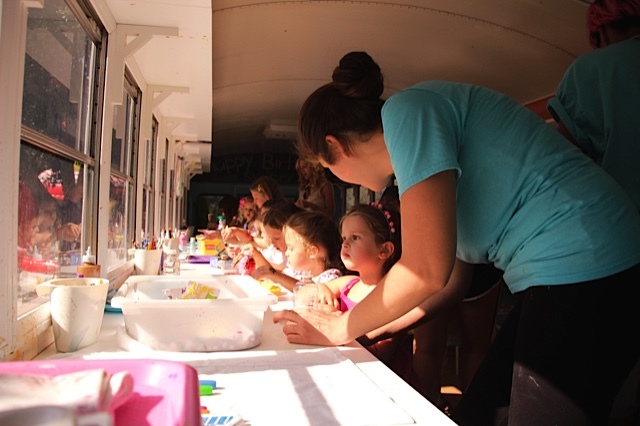 that the kids can not only paint the exterior of (and the tires) but is filled with amazing nooks and crannies inside for custom art projects, hair chalk, body tattoos, face painting and more. And the best thing about it is they come to you! 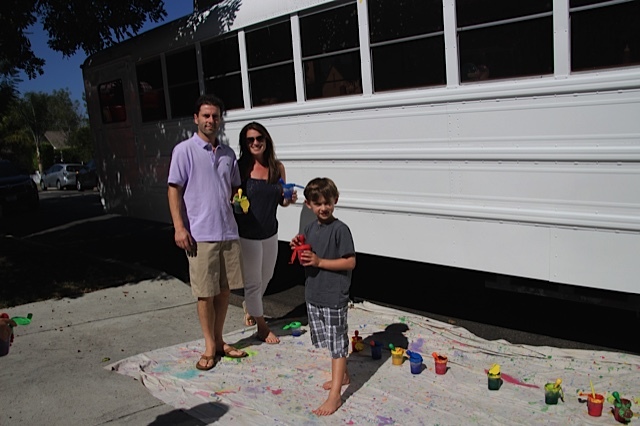 I can’t tell you how many guests couldn’t get over the fact that the kids could actually paint the bus! Inside the bus there is project for everyone of all ages, boys and girls alike and the staff takes the time to really work with each kid to create a masterpiece. Check out some of our pics below and tell Selin you heard about them from me! You can also check out their Facebook page for more info. In July, Tuesday Matinees presents family-friendly musicals perfect for everyone on summer break. 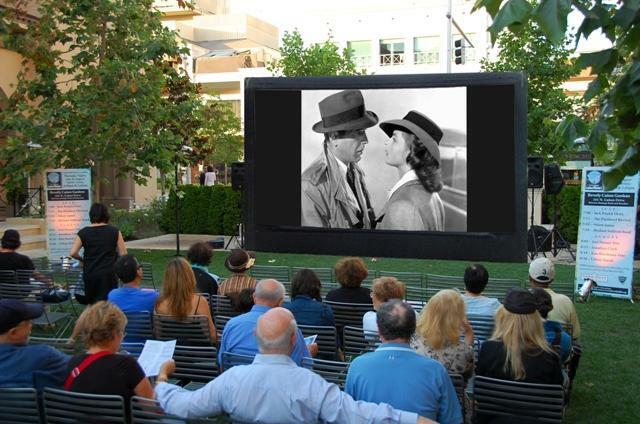 See classics like The Music Man, Mary Poppins, and An American in Paris… Every Tuesday, LACMA screens a classic film as part of the ongoing Tuesday Matinee series. 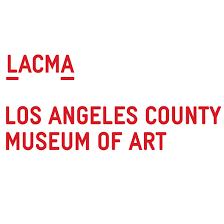 Tickets: $2 seniors and LACMA members; $4 for general admission. Complimentary parking is available in the Beverly Canon Gardens lot (241 N. Canon Drive) and simply requires validation at the events’ information table. Seating is first-come, first-serve with space both on grass and café tables. My foodie friend Amie and I went to this a few years and it was something I highly recommended going to if you LOVE CRAB! 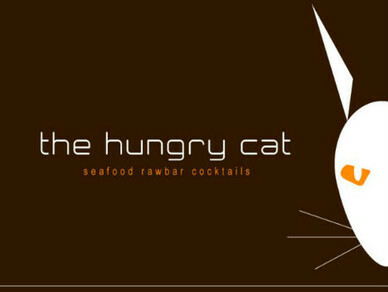 Hungry Cat Hollywood has cornered this event so you can expect special cocktails conceived by Bar Manager Dona Bridges – Mr. Tea with vanilla rye whiskey, lemon and iced tea and the Teaches of Peaches with blanco tequila, mezcal, peaches and chili salt – along with The Hungry Cat’s Camarones Michelada and the complete list of Thirsty Cat signature cocktails. This is a ticketed event; tickets for reservations may be purchased in person at The Hungry Cat Hollywood or by phone at 323.462.2155. 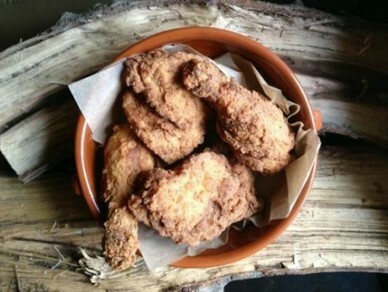 Every summer, Lucques is transformed for a night of Sweet Tea-Brined Fried Chicken served with her Pulled Pork “Sundaes” with Coleslaw and Baked Beans, Succotash with Cherry Tomatoes and Black Eyed Peas and House-Made Biscuits with Honey Butter. A dessert of whiskey-chocolate cake with caramel bananas and vanilla ice cream by Executive Pastry Chef Sahar Shomali finishes a perfect evening. Expect a new speciality Tennessee whiskey cocktail by Christiaan Röllich along with suggested wine pairings by Caroline Styne. Pricing for the dinner is $55, exclusive of beverages, tax and gratuities. You can make a reservation online or call 323-655-6277. LA Sanitation Open House at Stoner Ave June 27th! 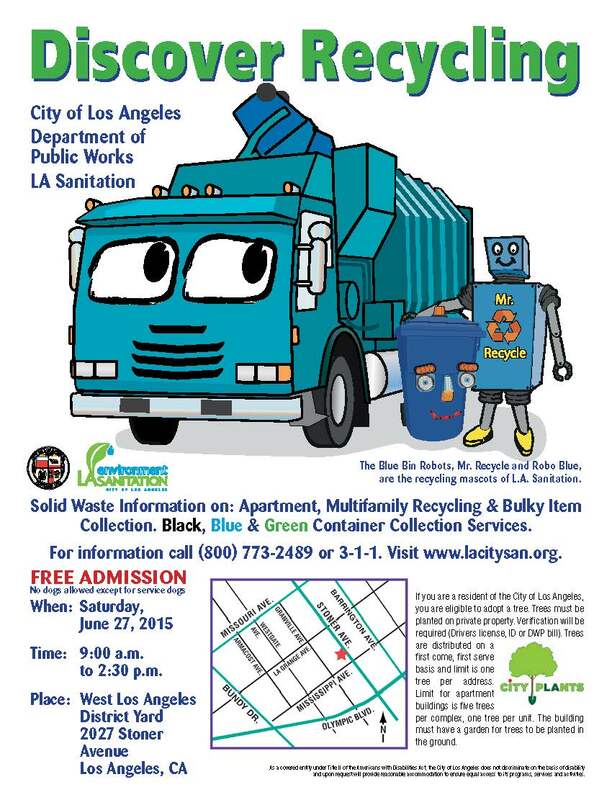 LA Sanitation is hosting their Westside Open House June 27th from 9:00 a.m. to 2:30 p.m. Come join the dynamic duo “Mr. Recycle” and sidekick “Robo Blue” as they jump into action to serve family fun, food and prizes for kids. If I have to buy another box of Z Bars for my son I’m going to go NUTS! So I have been scouring online for the perfect one that isn’t too sweet but will be something he’s sure to like. And I found it. 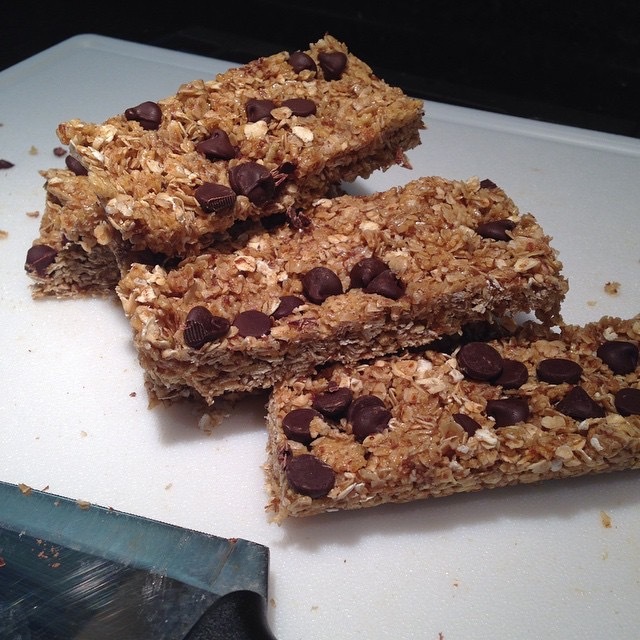 These were perfectly easy to make, and the best thing is I didn’t have Rice Krispie’s like the recipe called for, so instead I used Chex cereal and just smashed it up with my hand. You’d never know the difference. (I also omitted the almonds.) I’ve kept them in my refrigerator and they have been our go to snack this weekend and went straight into his lunch box today! If you love Mexican food (and Mexico!) like I do, you can learn to cook a multi-course Mexican feast from not one but two pros. Mary Sue Milliken and Susan Feniger are hosting a cooking class ($85) in the kitchen of their restaurant, Border Grill. You’ll learn tips, tricks and techniques for dishes such as crab and squid aquachile, cumin-marinated chicken and Negra Modelo cupcakes, then sit down to enjoy your creations. 3/14, 10 a.m. to noon; 445 S. Figueroa St.
Read more about and buy tickets here. Welcome to my blog! I am your typical SoCal girl.